At PCE Instruments you will find a power meter to show the power in Watts or to analyse and measure harmonics. The power meter is a multi-function device that measures precisely continuous current, alternative current, the intensity of DC or AC and power in Watts. The reading of AC power is considered the real value and has a maximum range of 6000 Watts. While a reading is being taken with the power meter, the polarity changes automatically, if negative values are taken then a minus sign will apear on the device display. Today, the power meter has many features such as, insulated current input, measurement of harmonics, current measurement, power measurement, etc. The Power Meter PCE-N30P can determine the most important system parameters of a single-phase network. Based on the current and voltage, the Power Meter PCE-N30P calculates the apparent, active and reactive power, as well as the phase difference angle and the power factor. The Power Meter can also determine the average power for a 15 minute period and the average voltage for a 10 minute period. The PCE-ND20 built-in power meter measures 3-phase all network parameters. Power, voltage, and power measurements are no problem for the PCE-ND20 built-in power meter. The current measurement can be done with the built-in power measuring device 3-phase and directly. However, it is also possible to measure high currents by means of transducers using the built-in power meter PCE-ND20. The power meter PCE-ND30 can be used to measure 54 parameters in a UI network. In addition to the performance measurement of the power indicator PCE-ND30, it can detect voltage, current, and harmonics up to the 51st order. The power display can be used as 1 or 3 phase. It does not matter if the connected load is balanced or unbalanced. The power meter PCE-PA6000 power analyzer can be used as a desktop or portable instrument for measuring active power, apparent power, power factor, energy consumption, AC voltage, AC current, DC voltage, DC current, resistance and frequency. The power / performance measurement can be performed with this power analyzer either directly with the supplied test leads, or indirectly by current clamps. 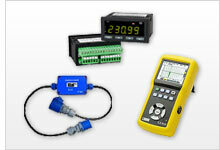 The PCE-360 is a Power Meter with data logger functionality. This versatile power analyzer can take single-phase and three-phase power measurements both in real time and over an extended time period. The Easycount-1-CEE-U energy meter is an electricity meter for alternating voltages up to 230 V, enclosed in a splash-proof and impact-resistant housing. The cable ends of the Easycount-1-CEE-U energy meter are equipped with male and female connectors. The Easycount-1-Schuko-U energy meter is an electricity meter for alternating voltages up to 230 V, enclosed in a splash-proof and impact-resistant housing. The cable ends of the Easycount-1-Schuko-U energy meter are equipped with male and female connectors. The Easycount-1-CEE-G energy meter is an electricity meter for alternating voltages up to 230 V, enclosed in a splash-proof and impact-resistant housing. The cable ends of the Easycount-1-CEE-G energy meter are equipped with male and female connectors. The Easycount-1-Schuko-G energy meter is an electricity meter for alternating voltages up to 230 V, enclosed in a splash-proof and impact-resistant housing. The cable ends of the Easycount-1-Schuko-G energy meter are equipped with male and female connectors. The EasyCount three-phase Power Meter is an energy meter embedded in a case protected against water, for three-phase current up to 400 V. The wires of the three-phase Power Meter, with a length on both sides of approx. 50 cm, have a male CEE connector and a female connector.